Ernest Joseph King was born in Lorain, Ohio, on 23 November 1878. He attended the U.S. Naval Academy beginning in 1897, including Spanish-American War service onboard USS San Francisco, and graduated in 1901. As a junior officer, King served in a variety of large and small ships, had instructor duty at the Naval Academy, performed engineering duties and was twice on flag staffs. He commanded the destroyer Terry (DD-25) and a torpedo flotilla during the "Teens". From 1915 through the First World War, he was assigned to the staff of Admiral Henry Mayo. Following that conflict and another tour at the Naval Academy, Captain King commanded a submarine flotilla and the New London, Connecticut, submarine base. In August 1928, following flight training and further service at sea, King became Assistant Chief of the Bureau of Aeronautics. The next year, he moved into command of the Naval Air Station, Hampton Roads, Virginia, and, in 1930, became captain of the large aircraft carrier USS Lexington (CV-2). Promoted to Rear Admiral in 1933, he was made Chief of the Bureau of Aeronautics. During the later 1930s, he commanded the Battle Fleet's aircraft carriers. In early 1941, following service on the General Board and as commander of the Atlantic Patrol Force, King was appointed to lead the newly recreated Atlantic Fleet through a period of steadily escalating tensions with Germany that led to undeclared war later in the year. The Pearl Harbor disaster brought Admiral King back to Washington, D.C., as Commander in Chief, U.S. Fleet in December 1941. 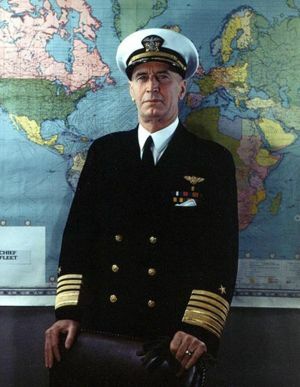 He also became Chief of Naval Operations in March 1942, holding both positions through the rest of World War II, in which he guided the Navy's plans and global operations. As a member of the Joint Chiefs of Staff, he was instrumental in obtaining sufficient resources to begin and sustain offensive operations against Japan despite a grand strategy of directing the bulk of America's power into the Atlantic and European theaters. King was promoted to the new rank of Fleet Admiral in December 1944. A year later, with the Second World War won on all fronts, he left his wartime offices, though retaining an advisory role. After several years of ill-health, Fleet Admiral King died on 25 June 1956. American Defense Service Medal, with bronze "A"
This page was last modified on 29 June 2016, at 23:39. This page has been accessed 11,883 times.